THE WANDERING EARTH – Cixin Liu (2013) | Weighing a pig doesn't fatten it. 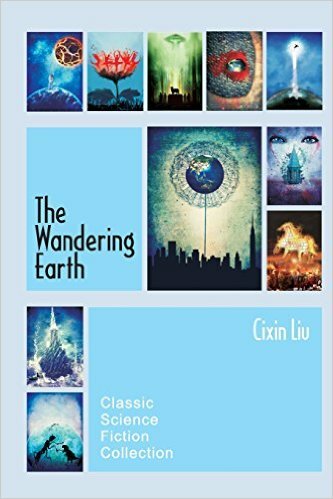 The Wandering Earth is a short story collection of the Chinese author Cixin Liu, who won the 2015 Hugo award for the compelling first book of the Three-Body trilogy. If you liked that, you’ll find much to rejoice in in this collection, with the obvious caveat that the short story form is something else than the novel. The book features 11 stories, mostly about 50 pages each. A few of them are loosely related. The translations were done by Ken Liu – who also translated The Three-Body Problem – and Holger Nam. Four of the stories won the China Galaxy Science Fiction Award. I’ll use the first story to point out some general remarks about this collection, and give a quick write-up and a hint about the subject matter of each of the other stories afterwards. The title story, The Wandering Earth (46pp., 2000), is a grim tale about the migration of planet earth to another star. It is strangely beautiful and is filled with great ideas. Like most stories in this collection, Liu uses a detached narrator, with a hard to define sense of time and pacing, which seems more free than most Western stories. And just as in all the other stories, emotions of characters exist, but are mostly subdued. There’s some great imagery and the prose is crystal clear, as throughout the entire book. Interestingly this story is nearly only telling, yet that doesn’t feel bad at all – like most stories in this collection, this is very much a tale. Mountain (47pp., 2005) is about an encounter with mechanical aliens that evolved inside a distant planet. It features a kind of parallel history to our own scientific evolution, and it is very, very cleverly done. The main protagonists provides enough balance so that the story doesn’t feel like a history lesson only, yet achieves some insights about the nature of being human too. Of Ants and Dinosaurs (56pp., 2003) didn’t work for me. It is quite literally a fable: an alternative history of a society of ants and dinosaurs that symbiotically evolved before the dawn of humanity. It has some merit and mostly has a fun, lighter vibe, but ultimately fails because of giant plot inconsistencies. Sun of China (49pp., 2002) is the aspiring story of a young & poor villager going to the big city, joining an important scientific project. It’s set in the near future of the 21st century. It’s fairly interesting and has some obvious egalitarian social commentary, and a hilarious deadpan cameo of Stephen Hawking. The Wages of Humanity (54pp., 2005) combines the story of a hitman with that of an alien invasion. On top of that it’s hard-hitting satire on capitalism. It works very well, it’s both funny and mysterious, and has some beautiful, albeit gruesome, images. Curse 5.0 (22pp.) is the story of a computer virus’ evolution. Liu also pokes fun at himself here. Imaginative, although a bit repetitive near the end, and a bit predictable too. The Micro-Age (30pp., 1998) is short and underdeveloped. It’s idea of humans that evolved to nano-scale is nice, but not much more. It’s also dated, since the insights on the importance of our human microbiome are totally absent from this story. Devourer (45pp., 2002) is about a giant generation starship of lizards that plunders planets, and the reaction of humanity as it approaches Earth. It’s Godzilla meets Roald Dahl meets Independence Day and it’s as deadpan hilarious as it is bleak. Taking Care of Gods (40pp.) deals with an atrophied seeder civilization that returns to Earth. Ultimately, it’s about love. It’s interesting and fits this collection well. With Her Eyes (18pp., 1999) is the shortest piece in the collection and to say something about the content would spoil it. It’s more poetic than an actual story. I liked it. The Longest Fall (58pp., 2003) is the last and longest story featured. It is about a scientist involved in an experiment with unforeseen consequences for the entire Earth. It again shows Liu’s fascination with the interior of planets. It’s a classic SF tale about the possibilities of aspiring human imagination. It’s okay, but sadly inconsistent in the morality some of its characters employ, which makes for a rather silly narrative arc. In a way, most of these stories are about the tension between hope and the inevitability of demise; and the insignificance of the individual when compared to the whole of society or the whole of the universe. In that sense, Cixin Liu clearly is an Eastern writer. The mild strangeness of these Chinese stories may well be an additional delight for most Western science fiction readers that crave Otherness. This book is available as a print-on-demand title, so it is unlikely you’ll find it in your regular bookstore without ordering it. This entry was posted in Reviews and tagged 2000s, 2010s, Cixin Liu, Ken Liu, Review, Science Fiction, short fiction, The Wandering Earth. Bookmark the permalink. How do you get a copy of this book? I ordered it online, I think on the Dutch online shop bol.com, but my guess is it might be unavailable by now. My edition was published by Beijing Guomi Digital Technology Co. Ltd. Could very well be a print on demand thing too. I think there’s a newer 2017 edition available that some European divisions of Amazon carry? ISBN-13 of my edition is 978-1489502858. Just checked, bol.com has the 2017 paperback, different cover. Other online retailers should have it too.